← Boo! Do you dare to see 5 paint colours inspired by Halloween? It is no secret that yoga is considered to be one of the most healthiest forms of exercise. Yoga is the ideal cool-down session after cardio training, or a great way to start the day to stretch out the muscles and tone the core. However, what is lesser known are the benefits of meditation. Recently, a medical study by Harvard University found that meditation literally rebuilds our brain cells. Harvard's research showed that meditating on a regular basis rebuilds the brain's grey matter in just eight weeks. Helping the brain perform at optimum levels is the foundation for our overall physical and mental health, which makes the case for designing a Zen zone all the more strong. Yoga and mediation tend to go hand-in-hand, so why not make the most of these perks by designing a 'Zen zone' at home? You could convert a section of your home gym into a meditation retreat, or go all out and devote an entire area to it. Don't feel as though this is only useful for the house – many modern offices should think about setting up a meditation zone as part of their employee engagement facilities. Stress is fast becoming a major workplace health and safety issue for businesses around the world. In fact, stress levels have peaked so high in recent times that the United Nations' International Labour Organisation calls this phenomenon a "global epidemic". Having a 'Zen zone' at work could prove to be an enticing offer for recruiting employees, showing the company culture is trendy and aware of the current global focus on health and wellness. Combine a Zen zone with a green, sustainable office and businesses have the recipe for keeping the current millennial workforce very happy! Here's how both businesses and home owners can use interior design methods to create a relaxing, meditative space. Get a lovely, positive glow in your meditation rooms by painting the walls in colours such as Resene Ayers Rock or Resene Teddy. These colours would look good beside the neutral, stone-coloured hues of Buddha statues that are often placed in such rooms. Or if you think more cooling and relaxing when you think of meditation, consider using cool and relaxing blues and greens, such as Resene Escape and Resene Carefree. Tranquillity is achieved by filtering out distracting sounds, either in complete silence or by using special serene music such as the sound of waves crashing. Ensure your room can do so, by adding speakers or insulating the space to cancel out noise. Just as important is having ample natural light – arrange bright cushions on the ground facing a window or glass sliding doors as the spot for meditating. Businesses can make the room feel like a collaborative environment by laying out floor cushions or mats in a circle. Fill the space with leafy green plants and flowers such as lilies and orchids. Such natural elements are scientifically proven to be calming for the senses. To complement the fragrance of the flowers, light some incense or scented candles for an added ambiance. 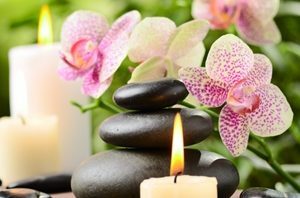 Such aromatherapy is renowned for inducing calm moods and easing our heart beat to lower stress. To get the best sounds as well as bring in a dose of nature, set up a small water fountain inside the room – listening to the water trickle gently will be a welcome melody as you meditate. Inspired by Japanese traditions, drinking hot green tea can be vastly helpful for your meditation. What's more, a study by Japan's National Cerebral and Cardiovascular Center found that people who drink green tea daily have a 20-30 per cent lower risk of having one type of stroke. Keep a kettle and tea leaves, along with a teapot and cups, in your room by making a tea station or cart. This entry was posted in Decorating Inspiration, Paint. Bookmark the permalink.